Corals: stressed or pessimistic? — Anderson B. Mayfield, Ph.D. I really like this pic. It just turned out so crisp (Spermonde Archipelago, Sulawesi); RIP TG4. 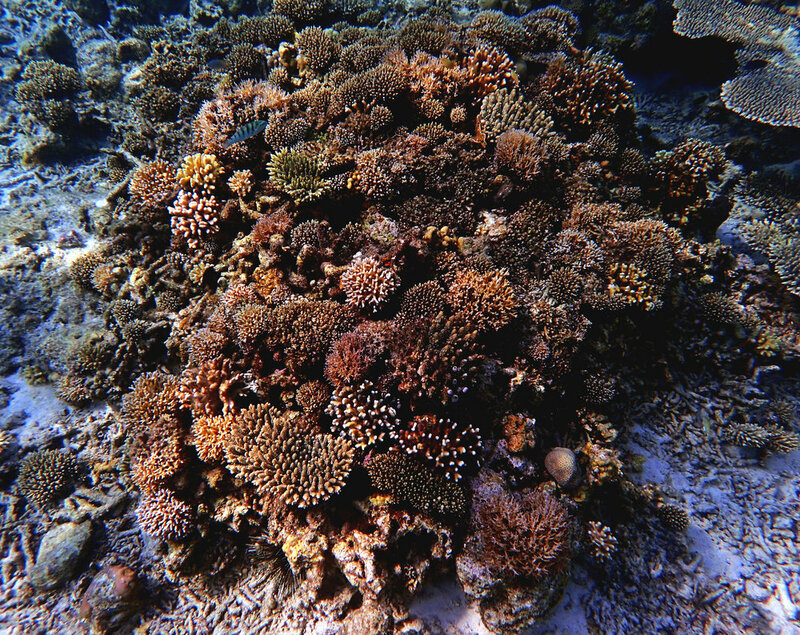 Issue #1: There are no healthy, control reefs against which to compare results of, for instance, biomarker surveys. Do we even know what constitutes a healthy coral in the absence of data obtained from the pre-Industrial era? I recently wrote a popular science article in The Conversation on just this topic. Click here for the article in English or here for Indonesian (thanks to my co-author Prodita Sabarini). Short answer: I don’t (yet) have an answer. Issue #2: Earth’s oceans are in a constant state of flux; does it make sense, then, to use “static” statistical tools (e.g., ANOVA) to analyze coral reef data, or should we instead be using something more dynamic like predictive modeling? Despite these two major issues, I have collected coral physiology data from reefs across the globe in the hopes that I can ultimately settle on a statistical pipeline that will allow me to assess coral health. Please keep in mind that we cannot simply carry out tank experiments, experimentally stress the corals, and then use this to drive our field studies (before, I had been doing tank studies for just this reason). Yes, I know people DO do this, but it is actually invalid. The reasons are because a "control" coral used in the hypothetical study is likely to be stressed already (due to climate change). Secondly, a "control" coral in a highly impacted place like Taiwan (where I work) may constitute a "stressed" coral in a relatively more pristine location. Also, common "stress" markers (e.g, HSPs) studied in model systems (e.g., humans) are expressed at high levels at all times in corals (or else I could use a biomarker approach). I have been using JMP to 1) model coral behavior in an endosymbiosis-tailored, statistically rigorous framework and 2) make predictions as to which colonies/reefs may be at most risk. Specifically, I am interested in the idea that VARIABILITY in coral response (as in, the variation across response variables within a single sample), rather than the mean response of individual response variables measured, is a more useful metric for those interested in forecasting behavioral change in reef corals and other marine invertebrates. This is based on what we know about transcriptional "chaos" and cancer. Maybe, though, I have become myopic from having been focused on this issue for so long and am missing something simple! If anyone has any ideas on how to glean the most insight from my coral physiology datasets (one of which is cited below and posted on JMP's website), I would be happy to hear from you. Thank you in advance for your time, and apologies for the long post.